KUNSTLER 2004 COLLECTABLE ORNAMENT – "AFTER THE SNOW"
Here for your consideration is the Timber Ridge School 2004 Collectable Christmas Ornament featuring Mort Kunstler's 1998 winter scene "AFTER THE SNOW." This is the 9th in a series of ornaments produced and issued by the Timber Ridge School. The scene in "AFTER THE SNOW" captures a Virginia landmark: the Winchester, Virginia Court House. It is 4:40 PM on January 6, 1862, about fifteen minutes before sunset. The sun has just popped out before setting as the storm that dropped about four inches of snow on the city passes off to the northeast. With Winchester changing hands over 70 times during the war it was in constant use by both the North and South to house prisoners. Kunstler chose to paint this scene in winter to feature the court house and not the prisoners that may be in the courtyard during better weather. This Christmas ornament was produced and issued exclusively by the Timber Ridge School, a licensed residential treatment center and accredited educational program serving young men between the ages of 11 and 19 with a history of serious emotional, learning, and behavioral difficulties. Funds for the improvement of campus programs and facilities are raised through the original sale of ornaments. 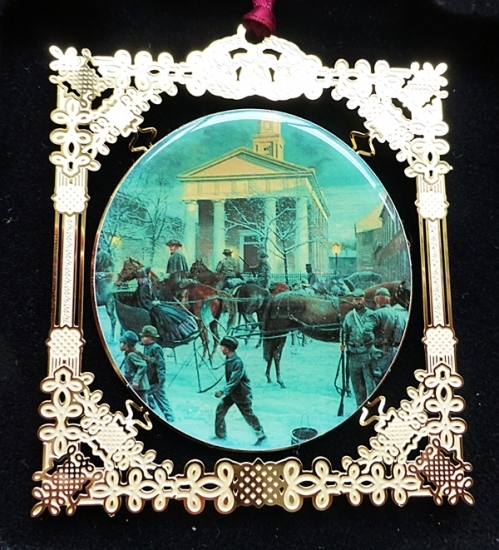 Mort Kunstler, a very generous supporter of the school, donated the use of his work "AFTER THE SNOW" for this ornament. No more than 7,500 of this 9th in a series of ornaments were produced. It has a 24 karat gold plated over brass border and is finished with burgundy ribbon. It is packaged in a burgundy presentation box with black felt backing and comes with a numbered certificate of authenticity and an ornament stand so it can be either hung on a tree or displayed on a shelf.